"Those who cannot remember the past are condemned to repeat it," said George Santayana. 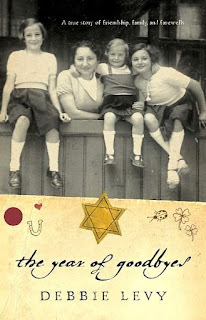 In THE YEAR OF GOODBYES (Hyperion), Debbie Levy recounts in simple verse the gripping story of her mother's escape from Hamburg, Germany in 1938. Levy stays true to an eleven-almost-twelve-year-old's voice, and as we follow the narrative of one girl's family, we realize with great unease that (1) the ascendancy of Hitler and the Holocaust happened not too long ago, and (2) such a tragedy could happen again. I'm not surprised that this powerful book was starred by Publishers Weekly, School Library Journal, and Kirkus Reviews. Meticulously researched and poignantly illustrated with handwritten excerpts from Jutta Levy's poesiealbum, THE YEAR OF GOODBYES is a perfect readaloud for parents who want to remember with their children. The afterword will and must break your heart, as Levy describes the fate of each friend who inscribed poetry in her mother's treasured album.